represents a complete document notebook in the Wolfram System front end. CreateWindow takes a DocumentNotebook expression and displays it in a separate window. 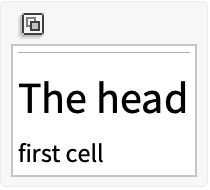 If generated as output within a notebook, DocumentNotebook displays as an in-cell representation of a notebook. DocumentNotebook can take any notebook option.